It’s still cutting metal, but micromachining presents some unique challenges. Strictly speaking, “micro” machining could be defined as work on the scale of a micron. However, many in the machining business will say that micromachining is making any very small part with very small features. No matter how you define it, micromachining means small features and tight tolerances. Micromachined parts can be made from metal or plastic. They’re used in many high-tech applications. For example, in a medical instrument, a tiny micromachined gripper can fit inside a blood vessel and remove a sample of tissue for lab analysis. Other very small mechanical systems you’ve probably heard of include MEMS (microelectromechanical systems) and nanotechnology devices. MEMS are typically made up of components in the one-to-100-micron size range, and a MEMS device or system might be up to 1 mm (0.039″) in size. MEMS components are usually made by thin-film operations, such as deposition processes, photolithography and etching, rather than machining. Nanotechnology works in the neighborhood of a nanometer, a billionth of a meter (0.000000039″); some nanotech materials, mechanical devices or features are built up one atom or molecule at a time. Though you could cut very small parts on a regular CNC machine, you might have trouble maintaining the necessary tolerances, which may be tens of microns or less. A number of manufacturers produce machining centers specifically designed with the rigidity, and vibration and thermal control needed to meet the dimensional and tolerance requirements of micro or miniature parts. Many of these machines offer capabilities and options that tailor them to micromachining applications: Tool changing, tool-tip measurement and offset, optional high-speed spindles, different coolant methods, pallets and built-in measurement systems. Atometric, Inc., Rockford, Ill., offers the G4-ULTRA, a general-purpose horizontal machining center that can be configured for 3-, 4-, or 5-axis operation. It machines within a work space 100 mm (4 inches) on a side. The machine positions to within a fraction of a micron, and the tool tip is positioned to within a micron. The G4-ULTRA comes with a 100,000 RPM servo spindle as standard equipment and a 200,000 RPM spindle is available. The machine provides automatic tool-changing from a 14-position holder. 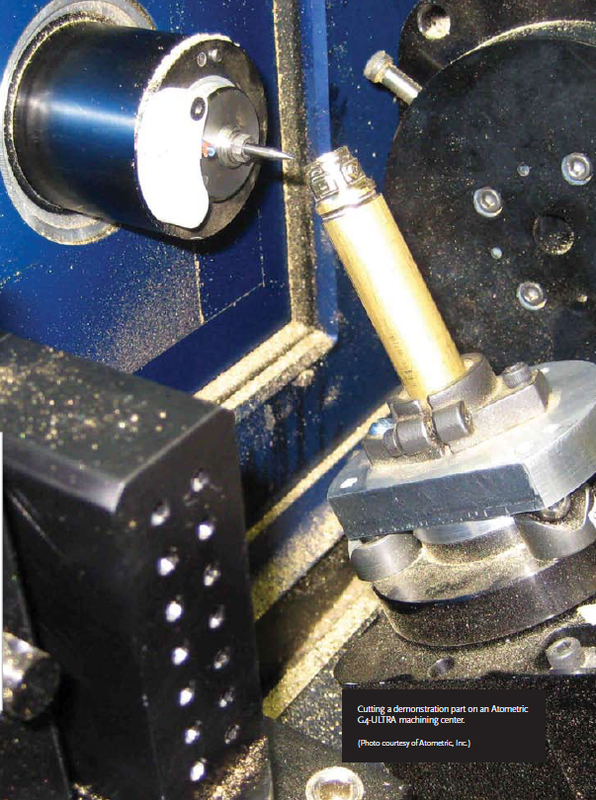 It places the tools directly into the spindle collet to minimize runout, rather than use tool holders. Conductive probing through the tool is available, and this capability can be used for broken tool sensing, as well. An optional confocal laser measuring system can measure conductive or nonconductive workpieces on the machine. Microlution, Inc., Chicago, Ill., produces a 363-S horizontal 3-axis milling machine, suitable for parts up to two inches on a side that require tools 1/8″ diameter or less, said Honegger. A 50,000 RPM spindle is standard, and options include 80,000 and 160,000 RPM spindles. The 363-S also has a 36-pocket automatic tool changer. Positioning is within two microns, and repeatability is within 0.2 microns. The unit’s standard software uses G- and M-codes; Microlution can also create custom software for specialized applications. For example, one customer requested to have a camera integrated into the unit for measuring fixtures and parts. Kern Precision, Inc., Webster, Mass., offers three models of 5-axis-capable machining centers for micromachining. The entry-level Micro system has a 10″ x 8.5″ x 8″ workspace. It provides one-micron positioning accuracy, and +_ 2.5 microns achievable part accuracy. The Kern Evo’s work space is 12″ x 11″ x 10″; it has a fully integrated pallet system and a tool changer expandable from 32 up to 95 tools. The Kern Evo provides 500 nm (nanometer) positioning accuracy and +_ 2 microns achievable part accuracy. The highest precision unit, the Pyramid Nano, has a work envelope of 20″ x 20″ x 16″, and provides 300 nm positioning and an achievable part accuracy of +_ 1 micron. The Micro and Evo models are available with spindles up to 160,000 RPM, and the Pyramid Nano up to 50,000 RPM. Electrical discharge machining (EDM) has its own micromachines. SmalTec, Lisle, Ill., produces two micro EDM units. The EM203 and GM703 provide three dimensional machining, similar to that done by a CNC machine, but where a very small spark does the material removal. In addition, these units can also machine with conventional cutting tools. The EM203 has a positioning range of 200 mm x 200 mm x 95 mm (7.8″ x 7.8″ x 3.7″), and provides machining accuracy of 1 micron on 10 mm, and 5 microns on 100 mm. The GM703 has a positioning range of 50 mm x 50 mm x 65 mm (2″ x 2″ x 2.6″), and provides machining accuracy of 30 m on 10 mm, and 170 nm on 50 mm. “We often use 100-micron or four-thousandths-diameter tools,” said Lindem, president at Atometric, Inc. That’s about the diameter of a human hair. It’s a challenge making a new part without breaking tools, he said, but then a tool will cut for hours. Tools 1/16″ or 1/32″ in diameter, or less, can be considered “micro” tools, said Robert Savage, president of Magafor Precision Cutting Tools, Turners Falls, Mass. His company offers end mills from 0.002″ diameter in 0.002″ increments, and reamers from 0.008″ diameter. A corner-rounding tool is also available for radii of 0.004″ and up. To minimize the number of tools required, Magafor offers an eight-function Multi-V tool from 0.020″ diameter, which drills, v-grooves, chamfers and performs other operations with a single tool. All the micro tools have 3 mm (1/8″) diameter shanks. Hex broaches for cutting driver heads are available 0.051″ across the flats and larger, from Hassay-Savage, Magafor’s parent company. RobbJack Corporation, Lincoln, Cal., offers end mills and other tools starting at 0.005″ diameter in one-thousandth increments, said Mike MacArthur, applications engineer at RobbJack. If you need an intermediate size, the company can hand-select for diameter down to the nearest 0.0002″. 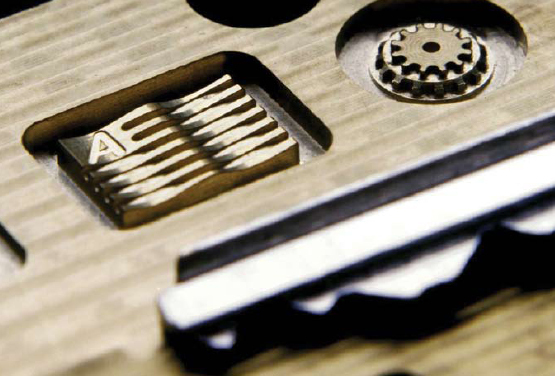 For prototypes and short runs of parts, Atometric uses uncoated carbide tools. Two years ago, coated tools under 0.025″ in diameter weren’t commercially available, Lindem said. Now, he says, they’re available down to 0.010″. In production the coated tools run faster and longer, he said. For certain specific applications, such as precision small diameters in graphite, or thin fi ns and ribs in plastic injection molds, a diamond coating may be called for, such as the CVD (chemical vapor deposition) diamond coating available from Crystallume, Santa Clara, Cal., a division of RobbJack. Though you can’t see the geometries of a tool’s cutting edge without a microscope, they’re still important. “People complain about quality and consistency,” said MacArthur. “One common thing I see in the marketplace is small diameter tools that don’t have any ground primary relief angles.” The correct angles and ground relief are important for quality of the cut, he said. SmalTec micro EDM equipment even allows you to make your own cutting tools. You can call up a special tool-making program and shape the tool in a section of the machine devoted to tool making, using a horizontal wire. “We can shape tools to any angle or diameter or features,” said Jerry Mraz, SmalTec’s general manager. “Every consideration you have — in fixturing, in coolant, in cutting a part — all the same considerations are in micromachining,” said Lindem, “but you have to be prepared that everything acts differently.” You’ll be able to apply all your knowledge, but often in new ways, he said. “You can run a day’s production and have a cup of chips at the end of the day,” said Lindem. The chips “look like fairy dust, but under a microscope they look like perfectly formed chips from a big machine.” Those tiny chips pose a problem normally not encountered in larger-scale machining. Lindem told of a situation where he would normally use a synthetic coolant. However, he needed to filter the coolant down to the one-micron level to remove those chips. Some of the lubricity components of the synthetic coolant were in the one-to-five micron size range, he said, so they were filtered out, too. “Use simpler coolant, misted coolants and oils,” said Lindem. “If you’re using a tiny tool and putting a lot of heat in a small area, you get coolant effect with misting coolant.” Also, be aware, he said, that if you’re running an end mill a couple of thousandths in diameter, if you put a stream of coolant on it, you could break it. Work holding can be a challenge for micro parts, which may be very delicate. “Sometimes we have the drawing and it looks solid,” said Lindem. But maybe the raw material is “15-thousandths wire, and it may not have much structural integrity. Not like a cast iron engine block.” Try using small versions of standard chucks, vacuum chucks or magnetic chucks. Magnets may work. The manufacturer of your machine can help come up with work holding schemes for challenging workpieces. Measurement of these small parts can be tricky. They’re hard to handle, they need to be fixtured, they may be fragile, and, of course, the tolerances are very, very tight. Many machining centers have contact, conductive or optical probing capability, so you can cut and measure the part without having to handle it. For measurement off the machining center, an optical coordinate measuring machine (CMM) might be a good investment if you’re moving into the micromachining business. Machining on the micro scale can widen your market in growing industries where the parts are getting smaller, such as medical devices. What it takes is the right equipment and a willingness to learn a new way of working.